Jacob has arrived. I love him but I’m still really not at peace with the diagnosis…at all. I was brought up in a very traditional Catholic home. At the moment I just feel very angry with religion/God. Why us? None of my friends have children with additional needs. How did you make your peace with everything? I’m so glad you wrote. I am reaching through the computer with a hug. Congratulations on the birth of sweet Jacob! I completely understand how you’re feeling — I had incredibly complicated emotions after Kate was born, as well. I absolutely loved her with every part of my heart, but I was sad, scared, and confused about her diagnosis. I get that. You are absolutely not alone. If I can offer you any piece of advice to start with, I would simply say: be patient with yourself. Your body just did an incredibly big thing and this season is tender and sensitive. It takes time to get to know any newborn, no matter what their ability. I’ve had a moment after each of my children, where I held them in the hospital, looked into their big blue eyes and thought: well, hello there, who are you? It takes time to grow in relationship with each other and the best thing you can do now is not worry about Jacob’s diagnosis, but try and focus on doing what you would do with any baby: snuggle him, feed him, rock him, sing to him. You don’t have to worry about what YOUR ENTIRE LIFE will be like raising a “child with special needs,” all you have to think about is what today holds. Be easy on yourself and just try and enjoy his soft skin, his new-baby scent. And then, next week or next month or in a few months, you may need to see a specialist for something — and when that day comes, you will be ready for that. As he grows, you will grow. As his needs expand, you will be ready for them. It will be uncomfortable at times, you may feel frustrated or confused for a little longer than you think you should, but it will get better — day by day. The more you grow to know him, the more comfortable you’ll become. I cannot overemphasize the importance of community, though. In those early days, I was surrounded by parents and a husband and friends who loved my baby girl and me and who encouraged me that everything would be OK (even if I didn’t believe them at first). If you don’t have any friends who have walked this journey, I encourage you to reach out to your local Down syndrome society. 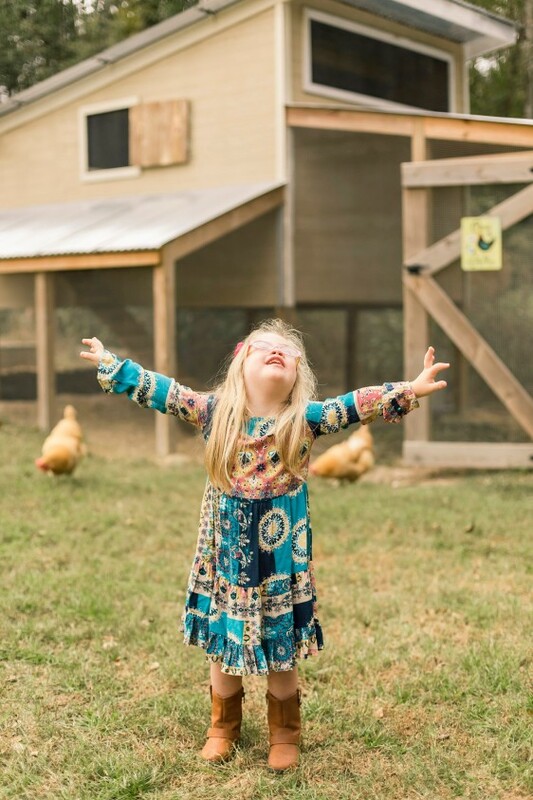 You’d be surprised at how many incredibly fun, loving, adventurous, thriving families there are with a child with Down syndrome — and not in spite of them, but quite the opposite! So let yourself get there naturally. As Fr. Teilhard de Chardin says, don’t try to force yourself to be today what time will make of you tomorrow. We all have to go through one season to get to the next, that’s ok. Just know — you will get there. 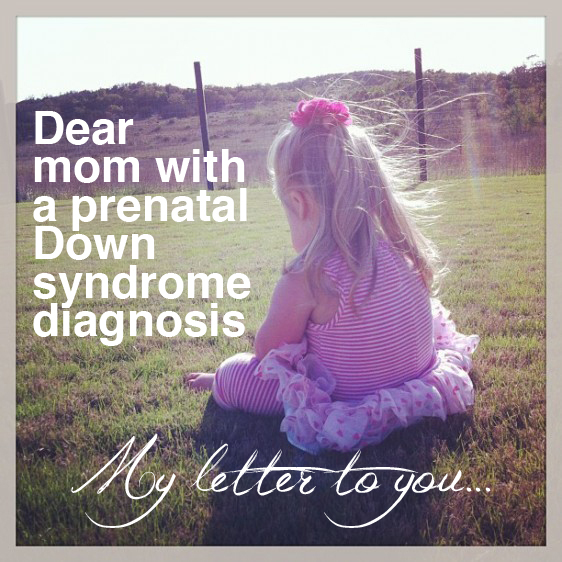 I can honestly say today that having a child with Down syndrome is one of the most incredible gifts I have ever received. Kate is so smart, capable, funny, enjoyable. I love to just hang out with her and laugh and play. She brings out the best in everyone in our family — and they bring out the best in her. I wondered what God was doing when I first got her diagnosis as well — but now I know: he was giving me a gift. You ask me — how did you make your peace? And I can say, I didn’t make it. It slowly came to me like a butterfly in the Spring and landed on my shoulder and there it stayed. Had I chased it when it wasn’t ready, I wouldn’t have been able to catch it. But with time and grace and days fully lived with my beautiful daughter, it came to me. It will for you. In the meantime, surround yourself with people who tell you all of this and more every day. I promise, you’ll get there. What a beautiful reply! I hope ‘Colleen’ was able to find peace in your words.